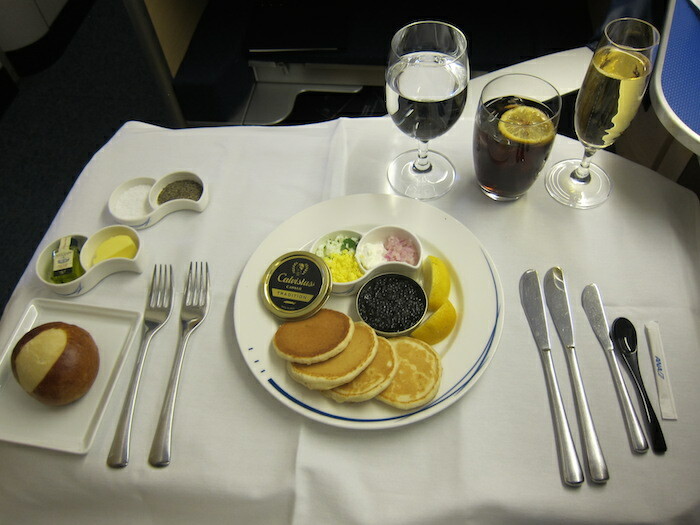 Recently Ben shared his ranking of what he considers to be The World’s Best First Class Airlines, based on his experiences flying pretty much every commercial first class out there. Unlike the fancy rankings you see elsewhere, with questionable methodologies that seem directly correlated to airline sponsorship, we pay for all our own flights, and do our best to stay anonymous. 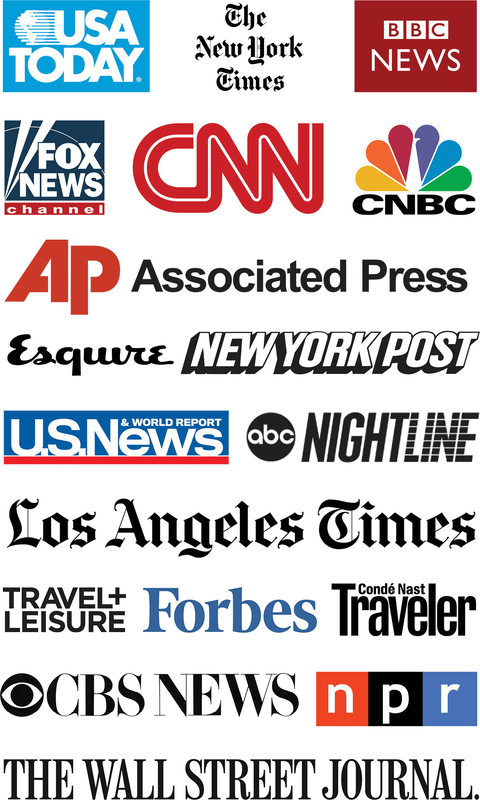 So while there are certainly still biases (Ben over-values tarmac transfers, and I have a fetish for caviar spoons), everything here is based on actual experiences, not infographics from marketing departments. I’m also going to link to a ton of past posts and resources, which will hopefully help with the nitty-gritty of actually making these bookings. Emirates isn’t in an alliance, but they have a ton of partners, so there are several interesting ways to redeem miles for their first class cabin. For the most part, Skywards isn’t a particularly compelling program, but in certain applications can make sense. Awards between North America and Athens or Milan aren’t horrible, and upgrades can be a great option on certain routes. Given that you can transfer points to Skywards from Membership Rewards and Starwood Preferred Guest, Emirates miles aren’t hard to accrue. Japan Airlines has the most lucrative chart for Emirates first class, as the program is distance-based, but a recent devaluation has dampened that significantly. 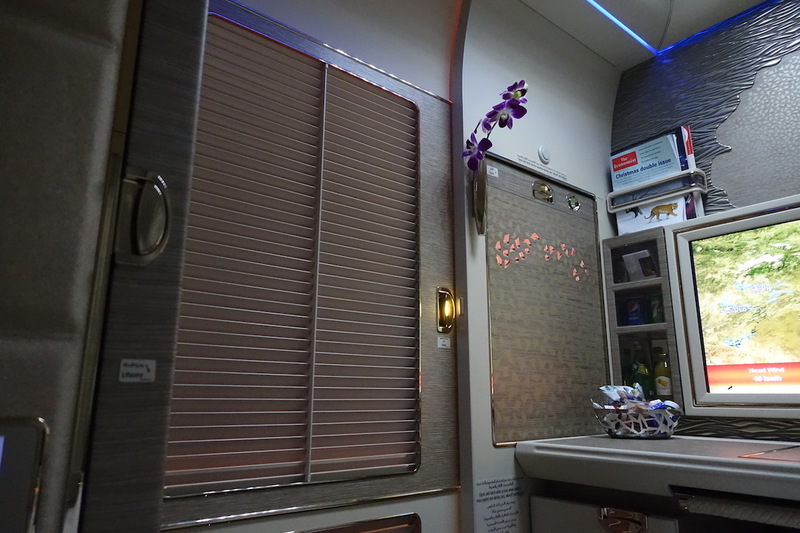 You can still do some fun things though, like book a five-shower A380 first class award from New York to Milan to Dubai to Bangkok to Dubai to New York (with stopovers in Milan and Bangkok) for 190,000 miles. The only reasonable transfer partner of JAL is Starwood Preferred Guest Marriott Rewards Marriott Bonvoy, which means you don’t have many options through credit cards, but if Marriott ever sells points at a discount, that could translate into a good value for some situations. Alaska used to be my favorite program for Emirates first class redemptions, but a shocking devaluation in early 2016 raised the rates to ridiculous levels. A one-way first class award between North America and Asia is now 180,000 miles (though you can stopover in Dubai, even on a one-way). Fortunately, Alaska miles are pretty easy to come by, either through their credit cards, purchasing during sales (though they have implemented new annual purchase caps recently), or transferring from Marriott. 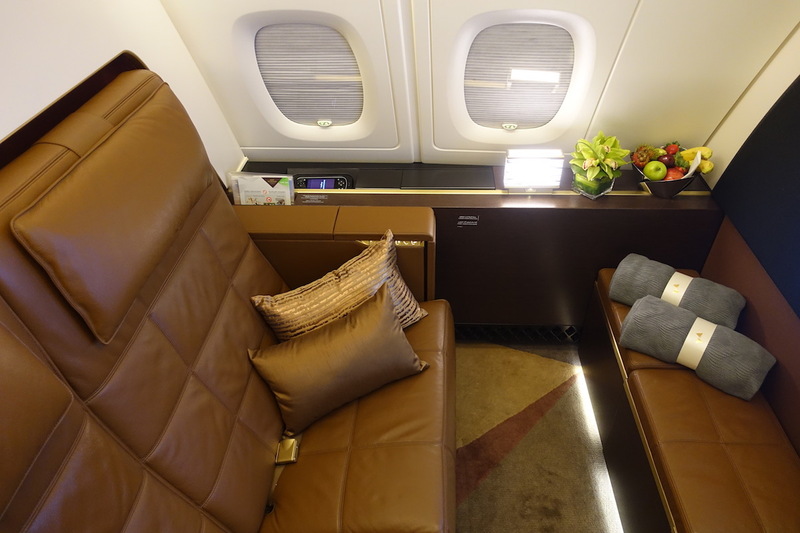 This would be my absolute last choice for redeeming miles for Emirates first class, but if you have a plethora of Skywards points, it is technically an option. A round-trip between the US and the Middle East is 210,000 miles in first class, but you’ll pay a whopping ~$1,400 in fuel surcharges. What really sets apart Air France is the first class soft product. The food is the best I’ve had on any airline, the service is impeccable and oh-so-French, and every part of the experience is thought out. Air France is tricky — there sadly aren’t any great ways for most of us to use miles. That’s because Air France only allows award redemptions for FlyingBlue elite members, and the prices are outrageous. A one-way ticket between North America and Europe is a whopping 200,000+ miles. One-way. Your best bet, and something I did myself a couple of years ago, is to keep an eye out for discounted first class fares, and combine it with the points rebate from The Business Platinum® Card from American Express. This will give you 35% of your points back, which combined with the great earnings rates of other Membership Rewards cards, can make Air France First accessible. My round-trip tickets between the U.S. and Spain ended up costing 167,000 miles per person using this method. It’s the crews that make the experience. Many surveys rank Garuda Indonesia as having the best cabin crew, and I have to agree. The warmth of the Garuda Indonesia flight attendants I had on both of my flights with them was unrivaled. That being said, GarudaMiles is a transfer partner of Citi ThankYou, and while the regular rates aren’t terribly lucrative (a one-way between Tokyo and Jakarta is 90,000 miles in first class), they occasionally offer sales on awards. On a good day, Singapore’s Suites might be the best first class soft product in the world. 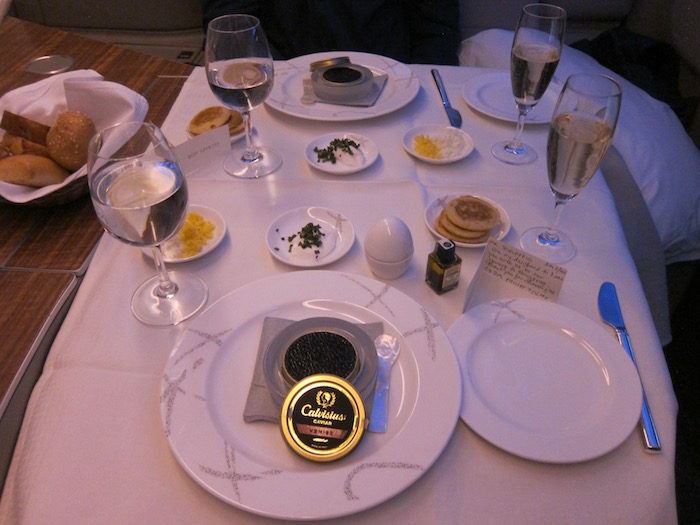 On a lunch or dinner flight departing Singapore their catering is typically excellent, and they sometimes have caviar, satay, etc. You can even “book the cook” in advance, and order from a huge menu that’s not otherwise available onboard. While Singapore is a Star Alliance member, they block their premium cabin space from partner redemptions. That means you’ll need Singapore KrisFlyer miles, which are fortunately easy to come by. All the major programs in the U.S. transfer to KrisFlyer, as do many international credit card programs. Singapore doesn’t often make two seats available at the Saver level, so we typically book one seat at Saver and one at the “Advantage” rate. There’s a bit of a premium, but not a horrible one to lock in two first class seats. You can also waitlist for lower-cost awards, which makes this one of the more accessible products on this list for the flexible and creative. What stands out is the excellent food (caviar, sushi, wagyu beef, etc. ), Salon champagne (the most expensive champagne served in the sky), the free and fast wifi, the ability to choose the firmness of your mattress pad, and the perfect service. JAL is incredibly inconsistent with award space. Sometimes the entire cabin will be available for award redemptions, other times I won’t see a single seat for weeks. They do open unsold seats to award inventory before departure, but it’s not as much of a guarantee as Cathay Pacific or Lufthansa. Securing JAL First is more a matter of being lucky than good, but there are ways of booking it that are better than others. Alaska offers amazing redemption rates on JAL, at 70,000 miles one-way between North America and Japan*, and just 75,000 miles to most of the rest of Asia. I still don’t know how India ended up in Japan for these purposes, just roll with it. You can still do a stopover on a one-way award, which is great for connecting beyond Tokyo. And unlike Cathay Pacific, JAL awards can be booked on alaskaair.com. American charges 80,000 miles for first class between North America and “Asia 1”, so if you’re going to Japan or Korea this is still a good rate. You can mix JAL flights with other partners, but continuing on to the rest of Asia will bring the price up to 110,000 miles. JAL flights don’t show up on American’s website, so you’ll need to search availability on Alaska or British Airways and then call to book. Again, the AsiaMiles program is complicated, but there are some potentially very interesting values. You can combine flights on American and JAL (both oneworld partners), say, from Dallas to San Francisco to Tokyo and back, which would be 220,000 miles for the round-trip in first class. You do technically pay fuel surcharges on AsiaMiles awards, but they’re negligible to and within Asia. While JAL has a distance-based chart for their partners, they use a zone-based chart for their own flights. So if you live in a city served by JAL (or can position), round-trip first class flights between North America and Tokyo are 140,000 miles. Given the relative difficulty of accruing JAL miles, however, I’d personally use Alaska miles (or American if I needed to add a connecting flight in the US). Cathay Pacific crews are also consistent and attentive. They’re always there during the meals, and when you need something during the flight, they appear in just a couple of seconds after pushing the call button. Cathay Pacific is the most consistent of the first class products (there are pros and cons to that as the product ages) and also is fantastic about making last minute first class award space available. Within a few days of departure it’s typically been easy to book, though what the impact of the first class fire sale will be on award inventory is anyone’s guess. The downside, is that it isn’t terribly easy to book beforehand. 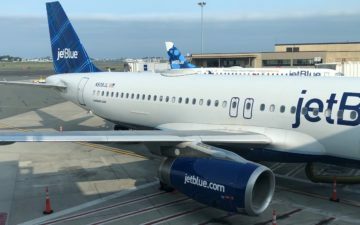 As a matter of policy only one seat is made available in advance on North American routes nowadays, so couples will need to book on separate flights, or separate cabins, and hope to streamline the itinerary closer to departure. On the one hand, Alaska has an amazing chart for Cathay Pacific, with one-way awards between North America and Asia just 70,000 miles, including a stopover in Hong Kong. On the other, some Cathay Pacific space is randomly and inexplicably not bookable through Alaska. This is easy enough to get around if you’re flexible, or are booking business class, but can be a real PITA if you’re trying to get multiple people into first class a day before departure. You also can’t mix partners on Alaska awards, so this really only works if you’re in a city served by Cathay or Alaska, or are willing to position on separate tickets. 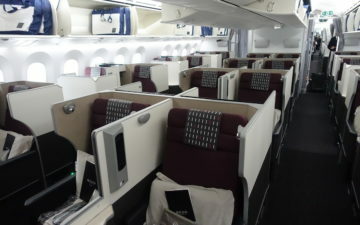 American has some complicated zones and routing rules, but a first class ticket to “Asia 2” is 110,000 miles one-way. It’s only an additional 5,000 miles to connect to the Middle East or India, but given that tickets through Alaska are a fraction of the price it can feel a bit painful to pay American’s rates. On the flip side, American has full access to all Cathay Pacific award space, can place awards on hold while you transfer points, and allows you to mix with partner carriers. So it’s still a solid option, especially considering how much easier it is to accrue American miles. The AsiaMiles program is complicated, as they have multiple charts depending on the carriers involved. They do, however, open their calendar for booking about a month before American does, and sometimes have a bit more availability for their own members than they offer to partners. You can transfer points to AsiaMiles from Citi ThankYou, SPG, or Amex, so there are a few options. Fundamentally, the AsiaMiles chart is distance-based, but prices are determined by the cumulative distance of the trip, not the individual segments. A round-trip ticket between San Francisco or Los Angeles and Hong Kong would be 220,000 miles in first class, while a trip between New York or Chicago and Hong Kong would be 250,000. In either case there’s still wiggle room to add connecting flights, which is nice, as two stopovers are allowed, but you’re also limited to two connections. The call center is also unfriendly, and not everything is bookable online, so you have to be pretty invested to book anything interesting. Like I said, it’s complicated. Etihad has a dine on demand menu with an onboard chef who can help you customize your meal, an onboard shower, and has the most square footage dedicated to each first class passenger of any airline. Like Emirates, Etihad isn’t in an alliance (though they’re slowly buying friends building their own alliance). 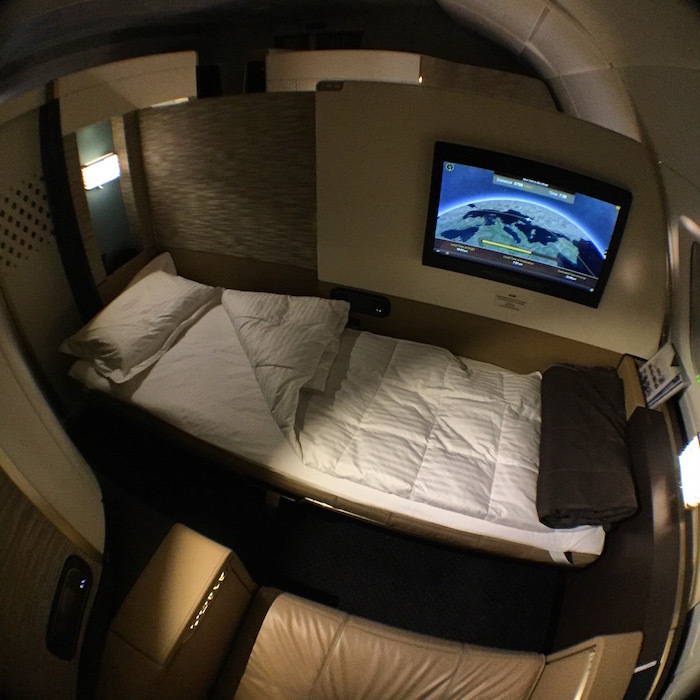 So there are a few programs you can leverage to fly Etihad first class. For all of these, you’re going to want to look for “Guest First” availability on the Etihad website — that space should be available to all partners. 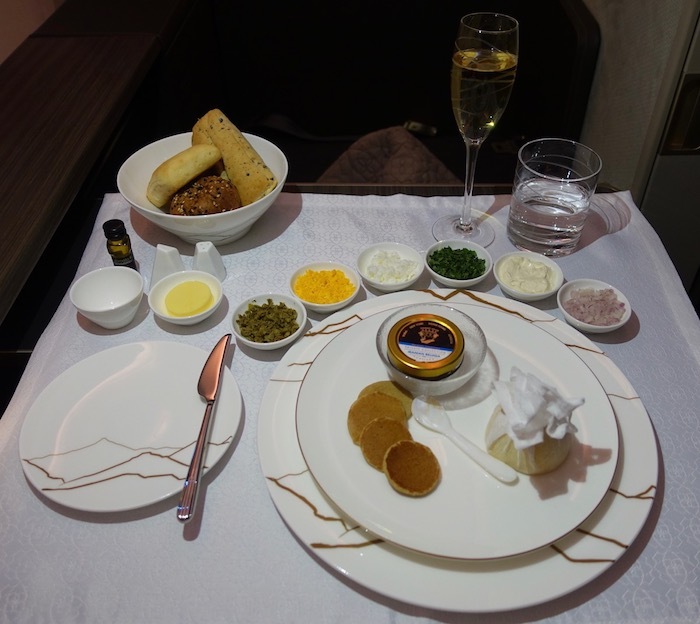 The relationship between American and Etihad is complicated, but this remains one of the best uses of American miles, and one of the best options for accessing Etihad first class. 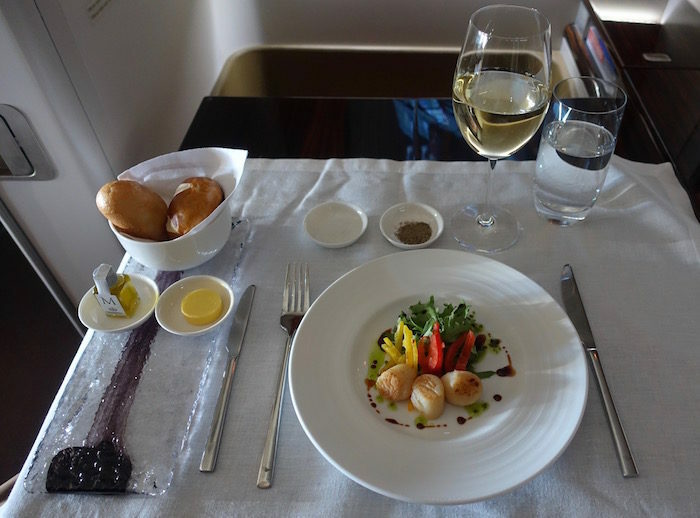 Asiana miles are difficult to come by (their only transfer partner is Marriott, though they do have their own credit cards now), but they have the most economical chart for Etihad first class. Sadly, as of January 1, 2019 Asiana no longer allows redemptions between Abu Dhabi and New York, but round-trip between Australia and the Middle East or Europe is just 220,000 miles (one-ways are allowed), and there aren’t any fuel surcharges. Potentially a fabulous use of Marriott points. Etihad first class can also be booked through Korean Air, but you will pay high fuel surcharges, and can only book for yourself or a registered family member. You can, however, transfer points from Marriott, for whatever that’s worth. 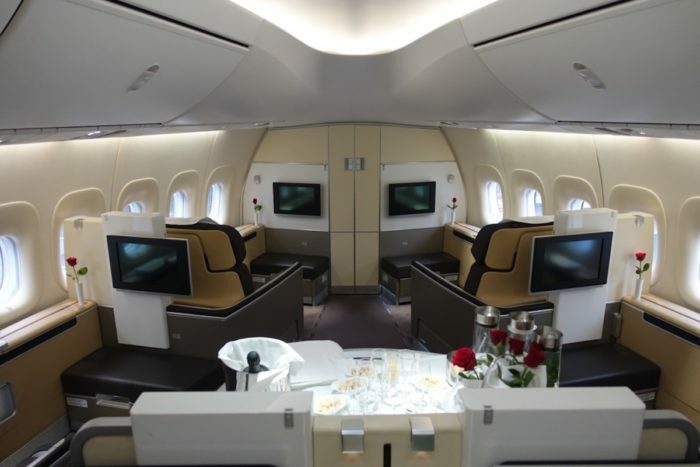 A roundtrip between North America and Abu Dhabi is 210,000 miles in first class. Korean Air offers a really consistent first class product. By far my favorite first class cabin they offer is on the 747-8, where they have just six seats in the nose of the plane. The seats are spacious, the amenities are excellent, and the food and drinks are very good as well. Similarly to Garuda Indonesia, Korean Air doesn’t make first class awards available to their SkyTeam partners. Availability is generally fabulous for members of their SkyPass program, however. 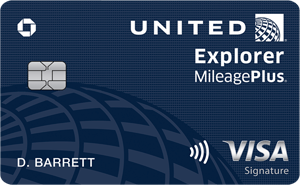 The downside, is that it’s more difficult to get SkyPass miles now that they no longer partner with Ultimate Rewards. But if you made a speculative transfer, or want to move points over from Marriott, a one-way first class ticket between North America and Korea is just 80,000 miles off-peak — Southeast Asia is just 95,000. I love Lufthansa first class for how consistent and elegant it is. 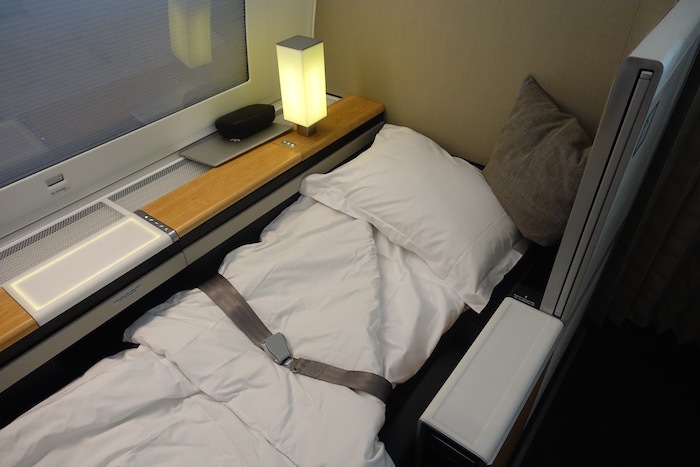 No, they don’t have the most private first class seats out there, but the cabins are elegant (in a German way), the service is among the best of any western airline, and they’re remarkably consistent in terms of their offerings. Lufthansa is reducing the number of routes with first class, but given how consistent they are in releasing award space, this is still a great option for redeeming miles. Keep in mind that partners only have access to award inventory within 14 days (which lately means within two days), so you’ll need to be flexible and a little brave to secure Lufthansa first class. Fortunately, you can use miles from any Star Alliance carrier during that timeframe, and I’ll highlight a few below. The nice thing about using miles from Lufthansa’s own program, is that you have access to first class as soon as the schedule opens. Awards between North America and Europe are also relatively reasonable, at 170,000 for a round-trip in First (182,000 after May 9, 2019). Children also get a discount, and kids under the age of 12 only require 75% of the miles. The downside, however, is that Miles&More are tough to accrue — they have a co-brand card in the US, but it isn’t terribly lucrative — or you can transfer points from SPG. You’ll also pay extensive fuel surcharges. Lifemiles doesn’t always have full access to Lufthansa award space, but when they do it’s 90,000 miles for a one-way in first class, with no fuel surcharges. Given that Citi points now transfer to Lifemiles, and they can be purchased at reasonable rates, this is my preferred way to redeem for Lufthansa first. United miles are easy to accrue (or transfer from Ultimate Rewards), and it’s a good thing, because their awards require a steep 110,000 miles for first class between North America and Europe. They have full access to Lufthansa award space though, and you still won’t pay any fuel surcharges. So this can be worth it for some. In theory Asiana has the best deal for Lufthansa first, at a paltry 50,000 miles one-way between the US and Europe (or just 40,000 SPG points). In practice, it’s nearly impossible to book, as partner award tickets can’t be issued within 72 hours of departure. And of course, you’ll pay fuel surcharges as well. Another case where you have to be lucky and extremely flexible. You’ll pay fuel surcharges, and will likely need to call to book, but Aeroplan is a reliable method for booking Lufthansa first. Transfers from American Express and Capital One are pretty much instant, and a one-way between North America and Western Europe is just 70,000 miles. If you book a round-trip, you can also have two stopovers, so this can be a very good option if you’re willing to pay the surcharges. All other Star Alliance programs will let you redeem for Lufthansa first class within the two week window before departure. Depending on the trip you have plotted out, programs like ANA can have good values, but keep in mind the surcharges will run ~$1300 for a round-trip. Swiss’ first class bedding is plush and comfortable, so a great night of sleep on Swiss is a given. 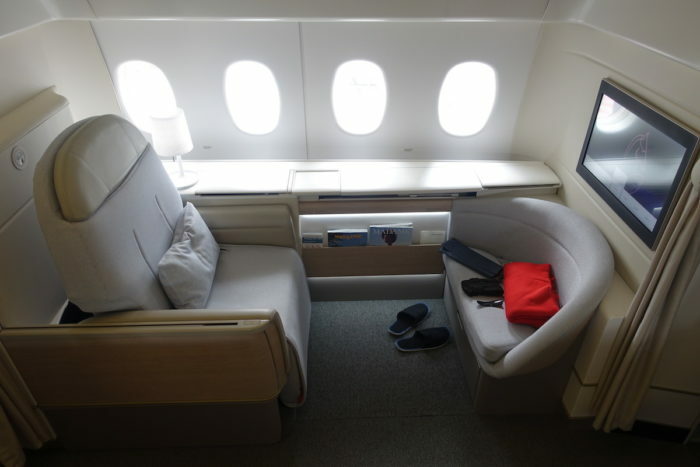 Like Air France, Swiss only offers the ability to redeem for first class to elite members of the Miles&More program. So you’ll want to use the same method here, and keep an eye out for discounted first class fares, and combine it with the points rebate from The Business Platinum® Card from American Express. This will give you 35% of your points back, which combined with the great earnings rates of other Membership Rewards cards, can make Swiss First accessible. Alternatively, you can book Lufthansa first and hope for a strike. ANA first class is great. Caviar, Krug, fantastic Japanese food, etc., but I find ANA’s seats to be poorly designed; they’re like cubicles, and have wood panels by your side so that you can’t easily look outside when you’re in a window seat, and can’t comfortably talk with your seatmate if you’re traveling with someone in the center seats; this is such a silly design. Service on ANA is fantastic, and award availability is typically on the generous side of decent, at least for one or two passengers. And there are a few good ways to book first class awards. For an otherwise awful program, Virgin Atlantic has fantastic redemption rates on ANA. The chart is distance-based, and you can’t combine with other partners, but a round-trip between Chicago and Tokyo is 120,000 miles. You’ll pay mild fuel surcharges, but given you can place awards on hold while you transfer points, this is the best deal for ANA first. ANA has a separate chart for flights on their own planes, and you can only book round-trips. They also have “Low, Regular, and High” dates, which are a bit opaque, but are roughly based on seasonality. Round-trip first class travel between North America and Japan is 150,000-165,000 miles, with ~$100 in fees. Other destinations in Asia require additional miles and higher surcharges, but can still be a good deal depending on the circumstances. Because ANA is in the Star Alliance, you can use miles from any other Star Alliance carrier. Redemptions can be pricey, with Air Canada Aeroplan, United MileagePlus, and Singapore KrisFlyer, with each charging ~100,000 miles for a one-way in first class. But there can be other benefits of using those programs, depending on the trip and the miles you have, so I wouldn’t necessarily rule them out due to the higher price. What makes Oman Air so great is the soft product — Cristal champagne, an incredible customized menu that you can order in advance, and some beautiful Omani touches. Oman Air isn’t in an alliance, though they do partner with Etihad Guest. You’ll need to call Etihad at 877-690-0767 at least seven days before departure to book. A one-way first class ticket between London and Muscat would be 80,000 miles, as an example, but you can find the full Etihad award chart for Oman Air here. Having your own three room suite, including a private bedroom and shower, with butler service, is a once-in-a-lifetime experience, and then some. Given that the Etihad Residence isn’t a “true” first class product, it can’t be found on any award chart, and you can’t redeem miles for it. 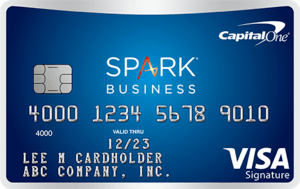 Your best bet for defraying the cost a bit is to look for a reasonable fare, and/or consider purchasing the ticket with a Capital One card to use the Purchase Eraser feature. We always talk about how the possibilities are endless when it comes to using miles, and I think this list is a lovely illustration of that. Even the most aspirational first class cabins in the world can often be accessed for pennies on the dollar by leveraging miles and points, particularly if you’re willing to get a bit creative. Have you used miles for any of these products? Which did you use? I haven’t read through these yet but I appreciate the effort in putting all these together! It’s going to help me a lot in deciding which loyalty program to credit everything to. Hi , I have difficulty finding 4 . But two 5 ranking. This is the first I’ve seen about asiana restricting etihad redemptions, that’s disappointing. Are you still able to redeem for nyc to auh using asiana? 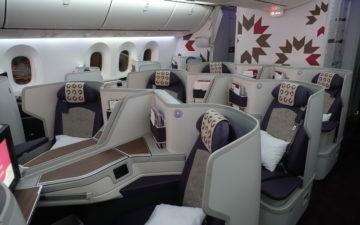 Has Emirates even made any award seats available on the new first class? That’s the only reason Lucky has them ranked #1. Doesn’t Etihad or AA block Etihad A380 award space ex-US? I thought AA agents couldn’t see it but possibly non US reservation centers could. Tiffany thanks for this comprehensive list of great options! And yes, thanks to y’all advice, I have been able to experience First on LH, EY, CX, JL & KE in C.
1. If you redeem a business award with Air France they do offer you at times during online check-in a chance to buy an upgrade to Le Premiere. I recently lucked out on a last minute 60K mile one way from IAD-CDG in business and then paid $1600.00 at check in to be able to try what is, I agree, one of the best experiences out there in F.
2. I am intrigued with the TK program (which you don’t mention) as it also seems to offer some really good redemption rates and low surcharges. But I am skittish about things I have heard about actually booking and a glitchy system. I see them come up in Juicy Miles with some really good rates but have heard horror stories about the process. A negative thought about an ME3 airline?! Surely against OMAAT policy?! You can book The Residence with points via Etihad Guest. If you’ve somehow got unlimited miles to burn then you could book now for LHR/AUH/SYD at just 2,325,991 miles. yes 2.3 million miles! Are you suggesting that Ben doesn’t take a full or partial U.S. income tax reduction for his travel expenses (flights and hotels) reviewed on OMAAT? Assuming he does, then I would respectfully suggest that his flights are partially paid for and subsidized by the U.S. government (now that he has moved to Florida and is no longer paying state income tax), which, of course means that all of us in the USA are helping to defray the cost of his travel expenses. (While I know none of you are tax experts and can’t give advice, it would be helpful to your readers who may be thinking of starting a travel blog to have a post on this subject). Honorable mention should go to Emirates F A380 booked via Qantas FF program going SYD-DBX-JFK for 192,000 miles. @VaCavalier Wow, dude. You are a full on internet gunslinger. Do you wear black at your computer with your holsters worn tight for the ready? Nah, probably just in your imagination. I am thinking you actually wear a passive aggressive grin and a bathrobe with used tissues in the pockets. @VaCavalier~ if you want to have a gripe about tax deductions, subsidies etc in the US tax system, then you should look at big and not-so-big corporations, high worth individuals (the Trump cabinet would be a great fishing pool), foundations and so-called charities . The tax deductions which Ben is entitled to, and may use, are freely available to many millions of US (and foreign) taxpayers. Well, take the credit cards out of the equation and the story is over, which is a reality for non americans. Flying to collect the miles for these redemptions takes forever. Best bet is to eye upgrade offers. I once managed BC>FC on AF for SIN-CDG for about $900. @glenn t and @stuart: There was nothing critical or negative intended by my post regarding the legitimate U.S. income tax deductions that travel bloggers who pay their own way . However, as Ben has in the past posted advice to those of OMAAT’s readers who may be thinking of starting a travel blog, clearly the tax treatment related travel expenses would be an important consideration and one in which Tiffany and Ben, based on their own experience, could provide light (not advice, just experience). You’re not even going to mention QF for EK awards and VA for SQ F awards (yes they can see the space) and EY F? I can appreciate leaving VA out as it’s not the easiest program for Americans, but it just shows as a bit of tunnel vision for the context of the writing however. QF does seem like a glaring omission though given they’re a Citi TYP partner. @ VaCavalier — I think I agree with @glenn t and @stuart that this isn’t really relevant? Legitimate expenses are always chargeable against revenue for any kind of business (and are not a tax deduction or subsidized as such — taxes are still paid on the net profit, just like with any business). Ben has always had his home base in Florida, so nothing has changed there either. Regardless, many other travel sites/blogs/etc. do take comped trips, or otherwise participate in pay-to-play coverage (and I’m sure they still deduct their business expenses from their profits prior to paying taxes too). OMAAT reviews and rankings are always arrived at independently, and I think that’s worth pointing out. @ Norman — Fixed, thank you! @ Stephen c — Not that I’ve seen, no; it’s the full route that’s blocked. @ Andrew — There are point of sale restrictions that limit how award space is displayed, but it’s still bookable! @James~ Maybe Qantas is omitted as it is a difficult program for non-Australians to accumulate points in. It’s points focus is on purchases; ie, goods and services, flying, and credit card sign-ons. Also partner redemptions involve an extraordinary number of points, and not inconsiderable carrier imposed surcharges. You would need to acquire enough points fairly effortlessly and low cost to find redemption rates palatable. Sure, and if QF we’re not a Citi partner when I probably wouldn’t have said anything. 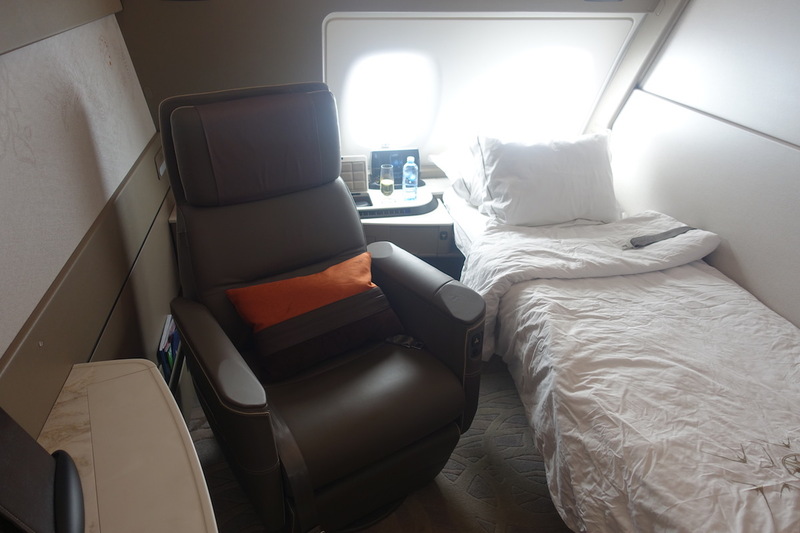 “This would be my absolute last choice for redeeming miles for Emirates first class, but if you have a plethora of Skywards points, it is technically an option. That could’ve very easily been a similar description for QF. That being said, there is still good value to be had in redeeming QF for EK, and if you were to book ex say MNL or GRU then the fuel surcharges are minimal. Just seems like a naive omission in my opinion. Hey Qantas fanboys, now you know how Canadians feel, reading this and most other excellent blogs, finding opportunities inaccessible to us. We’re all awash in Aeroplan Miles (and nothing else) which clearly aren’t the currency du jour for these F redemptions. Australians are no doubt drowning in QF points, paying horrendous Scamcharges just like us. Mentioning Aeroplan in this post didn’t bring me any comfort, just more frustration since Canadians don’t have ThankYou points, Ultimate Rewards points, or a decent list of transfer partners for their Membership Rewards points. “Nice” guys finish last? I just keep reading anyway and I profit handsomely from OMAAT’s content. VaCavalier – A tax deduction is not a subsidy. However, I believe there is an error. Cathay Pacific makes some of it’s award space available to American, but not all. I found this out when I was trying to book business class flights from IAD-SIN-SGN.